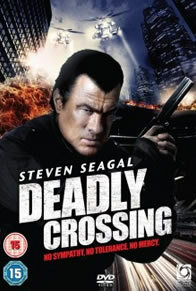 As part of the True Justice Series, Steven Seagal is Elijah Kane in Deadly Crossing, an explosive, non-stop thrill ride packed with mind blowing action sequences and brutal martial arts fight scenes. When an influx of violent and ruthless heroin dealers descend on Seattle, Elijah Kane (Steven Seagal) leads an elite undercover squad of cops to bring them to justice. Tearing up the rulebook, Kane and his crack team of law enforcers storm the city streets to clean out the drug barons by any brutal means necessary.